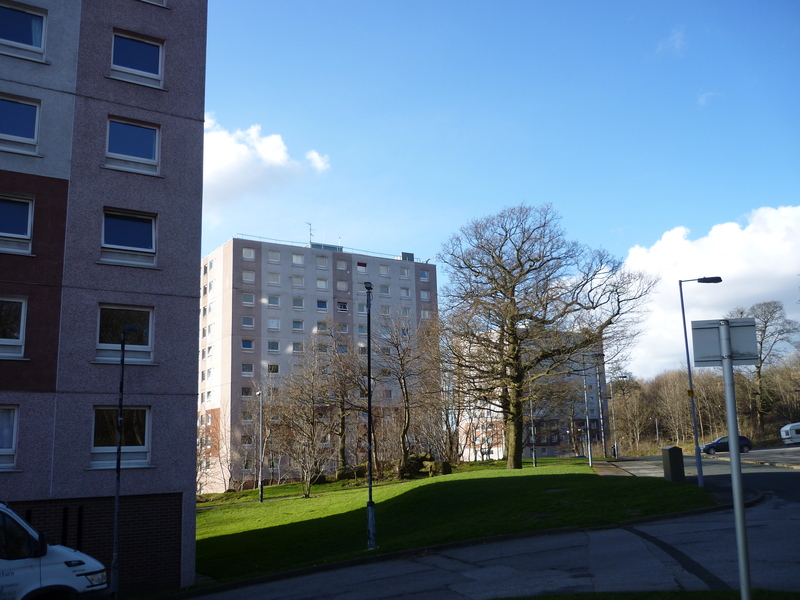 Note: this is the second part of a 3-part blog reflecting on a meeting at the headquarters of Incommunities, Bradford’s main social housing provider, last Friday. The context is outlined at the beginning of Part 1. My discussion of fire safety issues in Part 1 of this blog concludes by highlighting a slight risk of disconnect between policy-making at management level (even sound, evidence-informed policies such as ‘Stay Put’) and the personal experience of tenants. In what follows, I want to suggest that such risks seem all the more pronounced when it comes to day-to-day living in tower blocks like those at Crosley Wood. At our meeting last Friday, Chief Executive Geraldine Howley and Assistant Chief Exec Adrienne Reid acknowledged that Incommunities are fully aware that such blocks offer less-than-ideal housing conditions. If the opportunity arose for large-scale social housing developments today, they stressed, we would not be building tower blocks. While they were diplomatic enough not to say this, the hard political reality is that for decades now, successive governments have under-invested in social housing. Since 2010, Conservative-led governments have presided over a particularly steep decline in such new investment, even as the “right to buy” policy initiated by Margaret Thatcher back in the 1980s continues to reduce the existing social housing stock, by moving homes into the private sector. The inevitable result of such policies (seen by some as “managed decline”) is that, in many instances, people are being housed in buildings that are, in effect, “past their use-by date”. By transferring operational responsibility for these remaining social properties onto housing associations such as Incommunities (who are not directly answerable to voters, and who are required to balance their own books – by hook or by crook), the state has effectively absolved itself of responsibility for the escalating costs of maintaining our declining housing stock. High-rise blocks are, Geraldine pointed out, expensive both to maintain and to live in. For example, by comparison with low-rise accommodation, there will be a lift and a deep stairwell to maintain, as well as all the associated common areas (landings etc). And apparently, the rules governing housing associations — as laid down by the regulator, the Homes and Communities Agency — specify that the added costs associated with particular properties have to be passed on directly to the people living in them, in the form of supplementary charges on your rent. So even if it wanted to, Incommunities could not choose to distribute such costs evenly across its whole housing stock: it has to be those in the high-rise who pay! In practice, this means that some Incommunities tenants are literally paying more in rent and charges than they would be for a comparably sized flat in the private rented sector. (And note that it’s the Chief Executive who is volunteering this information! She has a problem with the regulations too…) For tenants reliant on housing benefit, the added costs of living in a high-rise are effectively just being passed back to the state (and the taxpayer…) through the welfare system. But for those who are trying their level best to work for a living, the impact can be brutal. As Jenni volunteers in our film High Rise Damp, she would like to be able to move out to (cheaper!) private accommodation, but good references from Incommunities have been a problem because she is in rent arrears… And those debts have been caused not just by the passed-on charges but by the condition of the family’s flat! When her son Dylan was sick with asthma, Jenni had to take time off work unpaid… running up debts to Incommunities even though the asthma was probably related to damp on the walls in their flat… A vicious circle if ever there was one. Damp and condensation are themselves a major issue with high-rise blocks. Jenni’s family had a particular issue caused by a ventilation shaft running through their flat (see film), but more generally dampness is a hazard of living in concrete boxes! As discussed in Part 1 of this blog, high-rise flats are often built as collections of sealed concrete boxes in order to minimise fire risk, but concrete is well known to be a very poor insulator…. it does not retain heat well, so concrete flats are costly to keep warm. The problem of heat loss explains the use of external insulation cladding on high rises, which at Grenfell tower turned out to be so murderously flammable. (Again: Bradford blocks do not have that type of cladding.) But according to Adrienne, a recent analysis of another Incommunities tower block revealed that the removal of exterior cladding would result in residents having to spend an additional £7 per week (£28 per month) to maintain appropriate background heating levels. The term “background heat” is important here because residents in such flats are recommended to keep them heated pretty much constantly in cold weather. If you don’t, you run the risk of condensation on your walls — when warm, wet air from, say, cooking or laundry meets cold concrete… If not promptly wiped away and dried out, such condensation will eventually result in mould and mildew. This may indeed be the case, although Jenni — as a resident at Crosley Wood — points out that, in her experience, many of her neighbours do not even bother to report such issues, because they have so little faith that they will be addressed in a timely or constructive fashion … or perhaps because they will be told that they themselves are to blame? (For more on Jenni’s own experiences with having to battle an intransigent bureaucracy, see Part 3 of this blog!) People with low social capital and confidence may not always feel empowered to demand changes to substandard living conditions, so reporting statistics alone are not necessarily a reliable indicator of the extent of the problem here. Returning to that term “lifestyle choices” — it’s surely a good thing if it might be revisited, but it also seems indicative of the general tendency to privatise problems that are generated by wider social and political circumstances. If a tenant has condensation problems, the blame is implicitly transferred to them as an individual. Incommunities, as a housing association which has to run as a self-sustaining business operation, cannot accept corporate liability for the problems generated by living in buildings that are “less than ideal”, because this would also make them liable for all kinds of additional costs, legal and otherwise. And those costs would themselves then have to be passed on to “the customer” — i.e. the tenant. Another kind of vicious circle. The delicacy of this problem is reflected in my very use here of the term “less than ideal”. In my previous draft of this blog, I used the words “unfit for purpose” (which I have also heard expressed by several other independent observers who have looked at the condition of the Crosley Wood flats). In her email feedback, though, Adrienne contested this language, insisting that: “Unfitness and structural problems have a precise meaning in relation to housing. . . . this language is too loose in my opinion, I feel the more accurate point you make is that they are not ideal.” Maybe she has a point: I am not a housing expert and cannot claim to be familiar with the specific connotations of technical language. But I do know a bit about how English works, and I’m not sure there’s any precise difference between saying that something is “less than ideal” and saying that it’s “unfit for purpose”. The word “ideal” is defined as “satisfying one’s conception of what is perfect; most suitable” … so, by definition, less than ideal means that it’s less than fully suitable… it’s somewhat inappropriate… so it’s possibly unfit for purpose… In short, we are talking about shades and degrees of language here, not clear-cut distinctions. Perhaps the distinction in language here comes down simply to this: from an Incommunities point of view, “less than ideal” is language that can be lived with, whereas “unfit for purpose” would place the onus on them to change the situation. With potentially unaffordable consequences. To conclude: there are a number of brutal structural problems — in the sense of both architectural structures and socio-political ones — that put both Incommunities and their tenants in something of a bind. That being the case, though, my next question is whether anything can be done to mitigate these problems within the parameters of what a housing association can control, and is responsible for? That’s Part 3. This entry was posted in Crosley Woods by Steve Bottoms. Bookmark the permalink.